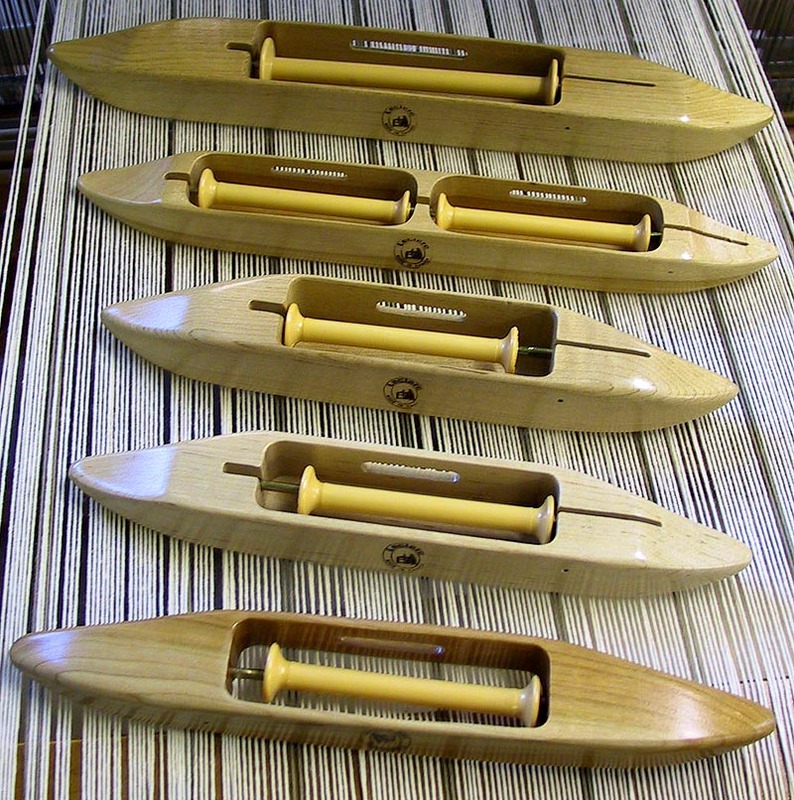 Whether you are weaving with a table or floor loom, need a flat, ski, rag or boat shuttle or just need some extra bobbins, Camilla Valley Farm Weavers' Supply offers what you need with quality Leclerc shuttles and accessories. 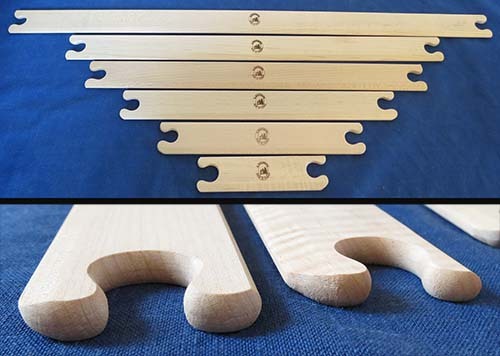 Leclerc Boat Shuttles are made with the finest Canadian Maple, cut into a classic well balanced design which is then sanded and polished to a brilliant shine. They come in five sizes and each has a metal bobbin support made of spring steel and a styrene bobbin . The slim boat shuttle and the flying shuttle, all have closed bottom designs. Weaving Tip - While larger boat shuttles hold more yarn, they do require a larger shed to be able to pass through the loom warp threads. Make sure that your loom produces a wide enough shed before ordering the larger shuttles. Boat Shuttle heights are listed in the chart below. 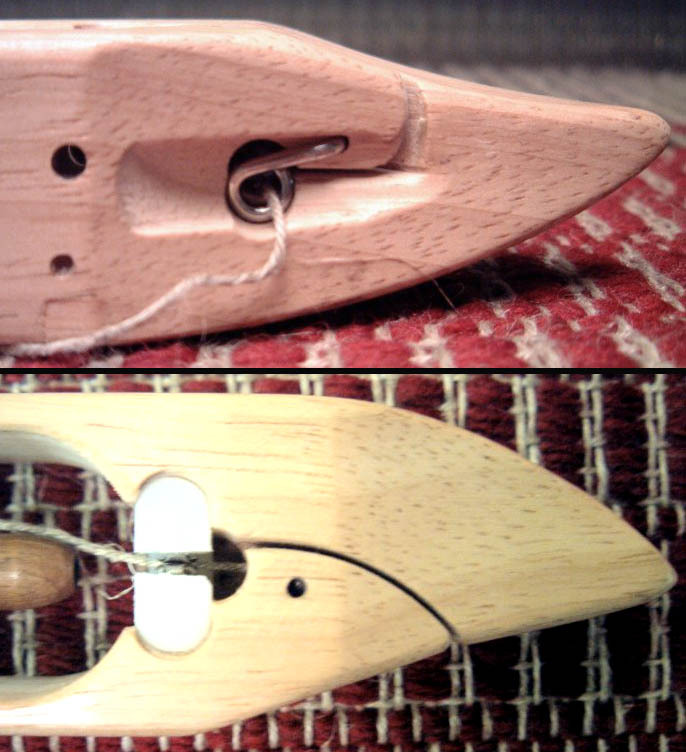 Note that for the Large Boat Shuttle, remember to add 1/4 inch to allow for the fact that the bobbin and yarn extend slightly above the wooden shuttle. To commemorate the 125th Anniversary of Leclerc Looms, the company has re-introduced the Traditional shuttle which is reminiscent of those produced by the company during its first century of operation. Designed to match the beautiful hand-crafted shuttles made in years gone by, the graceful shape of the Traditional shuttle fits perfectly into the natural curves of the weaver's hand. Each shuttle is crafted from kiln dried Canadian maple to give the owner years of weaving enjoyment. These new colored boat shuttles are made of high impact plastic (High Density Polyethylene), have the same shape as the traditional shuttle and are virtually indestructible. 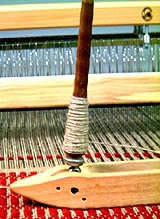 They are perfect for beginners and experienced weavers alike! These unique cost effective shuttles will last a lifetime and come in either Red, Blue, Yellow and Green. Weaving Tip - These shuttles are the perfect way to avoid mistakes when weaving with multiple colours of warp yarn that have a similar shade. Load each colour of yarn into a different coloured shuttle and you will find it easier to remember to alternate the coloured shuttles as you weave! 6122-0000 A Slim Boat Shuttle with open bottom and one 4" (10 cm) styrene bobbin. For use with table looms. 1" x 1 3/4" x 11"
6122-1000 B Small Boat Shuttle with one 4" (10 cm) styrene bobbin. For use with table looms. 1 1/8" x 1 3/4" x 11"
6122-3000 C Standard Boat Shuttle with one 4" (10 cm) styrene bobbin. For use with floor looms. 1 3/8" x 1 3/4" x 11"
6122-5000 D Double Boat Shuttle with two 4" (10 cm) styrene bobbins. For use with floor looms when two threads need to be woven at the same time. 1 3/8" x 1 3/4" x 13 5/8"
6122-2000 E Large Boat Shuttle with one 6" (15 cm) styrene bobbin. For use with large floor looms like the Kebec II. 1 3/8" x 2" x 15 1/4"
6122-6000 Middle Picture Traditional Boat Shuttle with one 4" (10 cm) styrene bobbin. 1 1/8" x 1 5/8" x 11 1/4"
6122-7003 Green Bottom Picture Coloured Plastic Boat Shuttle and one 4" (10 cm) styrene bobbin. 1 1/8" x 1 5/8" x 11 1/4"
Want to improve your selvedges and speed up your weaving? End Feed or "End Delivery" shuttles eliminate the drag on the weft that sometime occurs with shuttles that feed from the side. This results in a more uniform tension and removes the need for the weaver to adjust each weft shot to produce an even selvedge. Commonly found on industrial weaving equipment and flying shuttles, the yarn is wound on a pirn in the shuttle and flows easily off and out the back of the shuttle as it transverses the warp. The elimination of the need to spin a bobbin also reduces drag on the shuttle making it easier to throw. Leclerc End Feed Shuttles are the simplest to use and the most flexible on the market. Unlike products from competitors which have bull-nosed ends which are easier to manufacture, Leclerc EFS shuttles have a streamlined design that allows it to move quickly across the warp. The pointed ends of the shuttle are curved to fit comfortably into the weaver's hand in a similar fashion as Leclerc's standard boat shuttles. The yarn travels effortlessly off the end of the pirn through a guide and out the back of the shuttle through a steel wear guard. The guide also functions as an adjustable tensioning system allowing the weaver to set the perfect tension to match the yarn size and their personal preference. The wear guard extends the life of the shuttle long beyond those flying shuttles designed with a completely wooden guide. 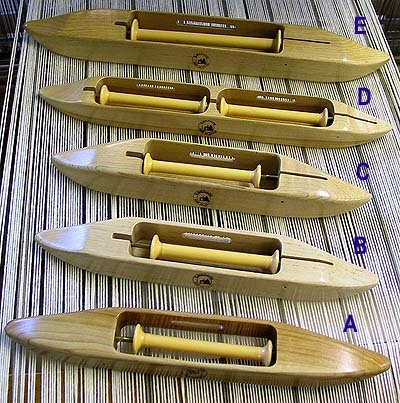 Unlike lower cost shuttles that require the weaver to thread the yarn around a maze of hooks, the Leclerc End Feed Shuttle can be threaded easily and effortlessly with no need to remember a complex threading pattern through the shuttle or put on your reading glasses to thread the yarn through a hole! 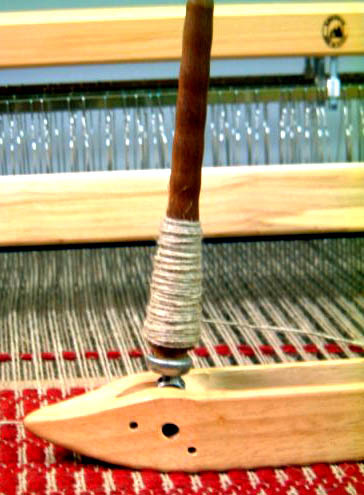 The weaver simply grabs the yarn end and pulls it through a slot in the shuttle side. The Pirn holder on Leclerc End Feed shuttles is designed to hold the pirn in place while in use, but enables it to be quickly removed for winding. This feature ensures small snags in the yarn will not release the pirn during weaving causing the mechanism to jam and the weaver to have to waste time reseting the pirn and fixing the selvedge. This is especially important with textured or "hairy" yarn that may occasionally bind together. with a 6" (15 cm) Maple Pirn. 13" x 1" deep x 1 3/8"
Note: Pirns are wound from one end to the other unlike bobbins where the yarn is wound back and forth across the length. Leclerc Manual or Electric Bobbin Winders are perfect for this task. Additional Pirns can also be ordered for this shuttle. These high quality End Feed Shuttles (EFS) are designed for use in production weaving where speed and consistancy is a concern. The Leclerc Professional Flying Shuttle is made of hardwood with stainless steel pointed tips to deflect warp threads mounted with a dampening pad to absorb impact. The yarn travels through a brass guide mechanism that incorporates an adjustable tensioning device that allows the weaver to set the tension based on the yarn type and the weaver's personal preference. The yarn is quickly fed through the shuttle without the pain of threading through holes or hooks. This shuttle is designed for use with the Leclerc Flying Shuttle Beater. Size information below can be used to determine whether it can be used on other loom vendors Flying Shuttle mechanisms. Additional Pirns can also be ordered. (includes one 7" (18 cm) professional Maple pirn) 1 3/8" x 1 5/8" x 15"
Additional Pirns can be ordered for the Leclerc Standard Flying Shuttle (picture to the left) as well as the End Feed Hand Shuttle, and Professional End Feed Flying Shuttle (both pictured to the right). These are made of hard wood and the two EFS shuttle Pirns have a metal tip for the locking mechanism. 6112-1000 6" Flat Shuttle 1 1/2" x 1/4" x 6"
6112-2000 10" Flat Shuttle 1 1/2" x 1/4" x 10"
6112-3000 14" Flat Shuttle 1 1/2" x 1/4" x 14"
6112-4000 18" Flat Shuttle 1 1/2" x 1/4" x 18"
6112-5000 21" Flat Shuttle 1 1/2" x 1/4" x 21"
6112-8000 28" Flat Shuttle 1 1/2" x 1/4" x 28"
6112-9000 36" Flat Shuttle 1 1/2" x 1/4" x 36"
These Leclerc Ski Shuttles are made from Canadian Maple to be used with medium to heavy yarn or rags. The yarn wraps around the shuttle so it slides easily through the warp. Two different sizes of ski shuttles are available. 6121-6000 Small Ski Shuttle (17") 1 3/8" x 1 1/2" x 17 3/4"
6121-7000 Large Ski Shuttle (27") 1 3/8" x 2" x 27 1/2"
These Leclerc Rag Shuttles are made from Canadian Maple with a smooth varnish finish. 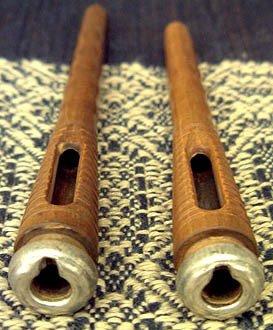 Versions in different lengths and with or without a removable rod to hold one or more bobbins are available (bobbins extra). A hole is cut in the edge for the thread in the versions with the removable rod. 6120-7000 Regular Rag Shuttle (15") 1 1/2" x 2 1/2" x 15"
6120-9000 Small Rag Shuttle (15") with Removal Rod for Bobbins 1 1/2" x 2 1/2" x 15"
6120-8000 Large Rag Shuttle (22") with Removal Rod for Bobbins 1 1/2" x 2 1/2" x 22"
6110-5000 Small Netting Needle 5 1/4" x 5/8"
6110-6000 Medium Netting Needle 6 1/2" x 7/8"
6110-8000 Large Netting Needle 8" x 1"
6110-9000 Extra Large Netting Needle 10 3/8" x 1 1/4"
These Leclerc Bobbins and Spools are designed to fit Leclerc shuttles and bobbin racks but may be used in other vendor's products. The bobbins are available in two sizes (see below to the left). They and the larger spool (shown right) are only available in plastic. about Leclerc looms and accessories. for more help in deciding which loom is right for you.